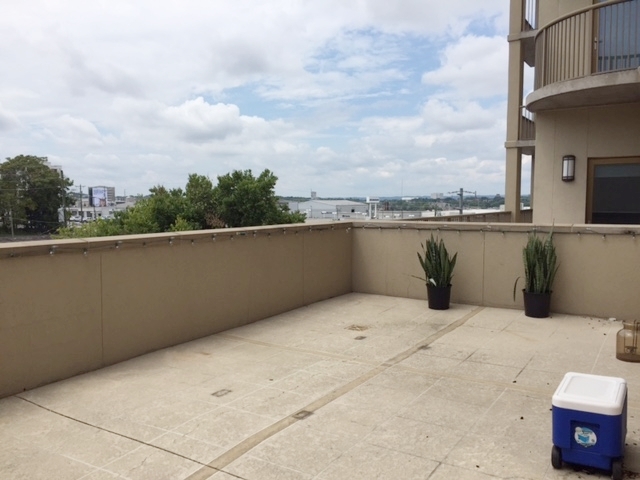 For this patio space there were two main things to tackle, the first being the overwhelming amount of beige and the second was it's expansive space with no real flow. Looking for a way to break up the beige, we started by adding a geometric rug under the farm table. The pattern adds a modern punch and helps to define the space as the dining area. 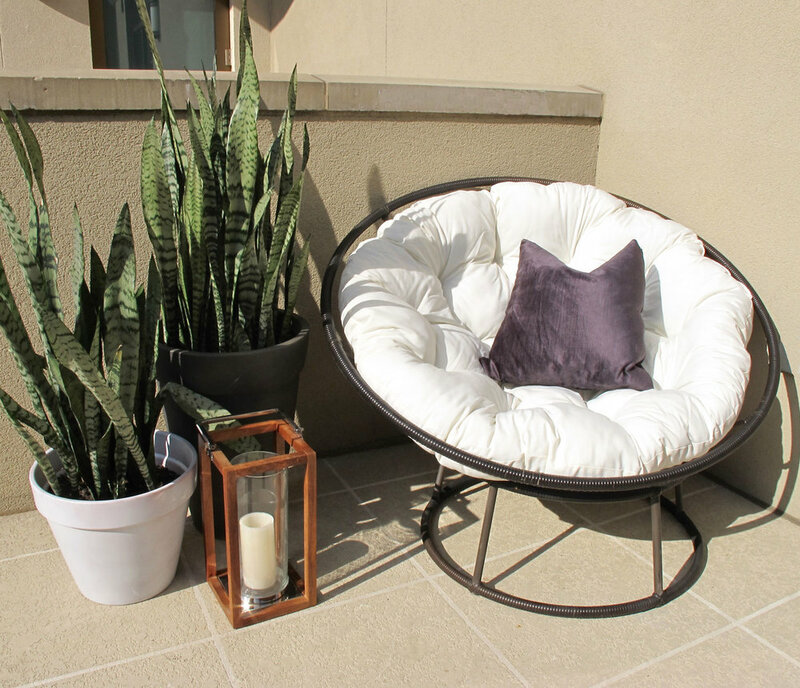 In the corner, we updated her existing Papasan frame by switching out her red cushion with one that's off-white (and weather-proof). A few new plants help to complete this cozy reading nook. 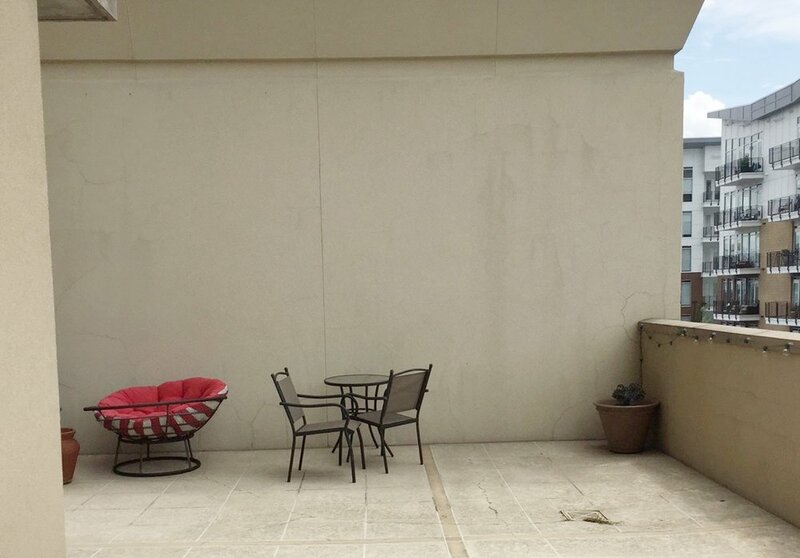 On the opposite side of the patio, we brought in a 4-piece conversation set with lots of cushions for lounging. It's white upholstery pops against the beige wall, giving a crisp, modern look and creating the perfect backdrop for accessories. We anchored the seating area by adding a light colored jute rug. It's shade, similar to the beige tone of the floor, doesn't take away from the accessories, while it's texture defines the area and adds to the warm, cozy feeling. 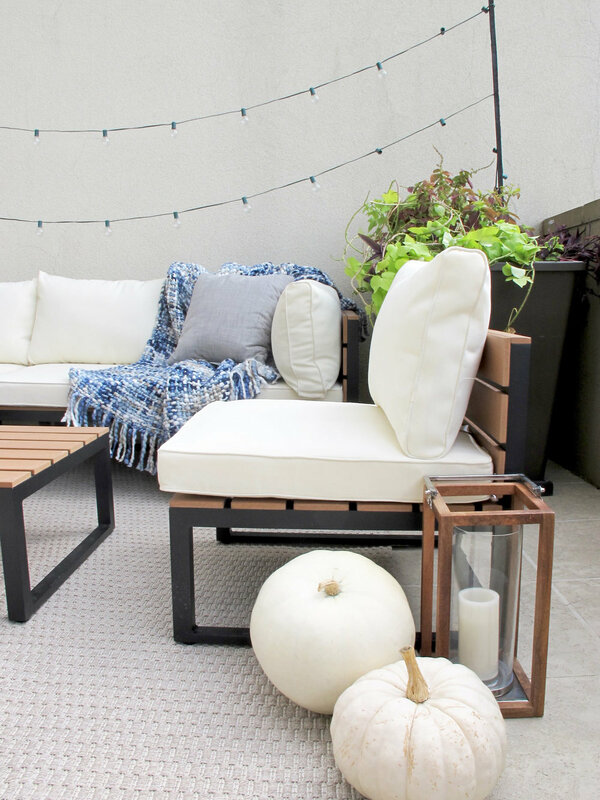 We accessorized with soft gray throw pillows, poufs for extra seating, and a chunky knit blanket (perfect for snuggles on a cool fall evening). To keep this space staying cozy from day to night, we added a backdrop of globe lights behind the couch and a few lanterns for a little extra ambience. Overflowing planters on each side add a gorgeous unexpected pop of color to bring this space to life. The best part? It's kitty approved!